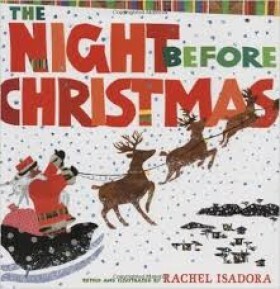 Perhaps none of the titles I've shared does that so well as Rachel Isadora's version of the Clement C. Moore poem, The Night Before Christmas. As she's done with other classic books, Isadora sets her tale in Africa, with all African characters, and sets off the familiar words with her gorgeous mixed-media illustrations. The collage effect she uses creates textures that combine beautifully with her vivid color palette, causing the images to just about jump off the page. No version I've ever seen captures the spirit, the joy, the pure delight that is childhood at Christmas. Reinventing a classic is always a bit of a risk, but in Isadora's capable hands, the result is simply dazzling. I mean, Santa with dreads? Snow in an African village? How can you fail to be enchanted by that? On Christmas Eve we'll be home, warm and cozy with a house full of loved ones. And you can be sure we'll be reading this book at bedtime, once Sprout is nestled all snug in his bed.